The Russian lawyer who met with President Donald Trump’s son may have been angling for the president. The episode raises questions about what happened during and after the meeting with Donald Trump Jr. and other campaign associates. “It’s like peeling an onion,” one expert said. 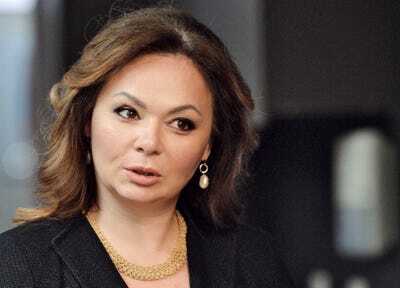 The Russian lawyer who met with Donald Trump Jr. last June at Trump Tower, under the guise of offering the Trump campaign damaging information on Hillary Clinton, may have been a “dangle” aimed at enticing then-candidate Donald Trump and his associates into colluding during the campaign. Joseph Nye, a professor emeritus at Harvard’s Kennedy School of Government who formerly served as chair of the National Intelligence Council, also said it was plausible Veselnitskaya was used to determine whether the Trump campaign was open to colluding with Russia. “The Kremlin is not so soft hearted that it would set up a meeting to restore adoptions,” Nye said. Trump Jr., the president’s eldest son, tweeted an email chain on Tuesday from June 2016 in which he entertained accepting damaging information on Clinton as part of the Russian government’s support for his father’s campaign. The episode signals that the campaign was willing to accept Russian help and has raised questions about what happened during and after the meeting with Veselnitskaya. “The act of offering such information was likely, at minimum, a trial balloon, and at best (from Moscow’s perspective), a chance to pass certain information from an agent of the Russian government to the Trump campaign through the candidate’s campaign manager and son, thereby also implicating Donald J. Trump himself,” wrote former CIA intelligence officer Rolf Mowatt-Larssen and former Department of Defence Special Counsel Ryan Goodman. What’s most important, said Bob Deitz, a former top lawyer at the National Security Agency and CIA, is determining what exactly was discussed at the meeting. Indeed, the email exchange between Trump Jr. and Rob Goldstone, the British music publicist who arranged the meeting between Veselnitskaya and the Trump campaign, appears to align with a series of pivotal moments during the 2016 campaign. Trump Jr. has so far maintained that Veselnitskaya offered him “no meaningful information” on Clinton during the meeting and quickly pivoted to discussing a Russian adoption program that was cut off in retaliation for the 2012 Magnitsky Act, which blacklisted Russians suspected of human-rights abuses. Yury Martyanov /Kommersant Photo via APIn this photo taken on Tuesday, Nov. 8, 2016, Kremlin-linked lawyer Natalia Veselnitskaya speaks to a journalist in Moscow, Russia. Either way, the revelations likely won’t be the last to emerge about the meeting. “Some of the remarks in the email exchanges hint at collusion in the hacking of DNC and Podesta email servers,” said Mark Kramer, program director for the Project on Cold War Studies at Harvard’s Davis Center for Russian and Eurasian Affairs. Bill Browder, the hedge fund manager who spearheaded the passage of the Magnitsky Act in the US after the death of his lawyer, Sergei Magnitsky, was also sceptical. Even if Russia didn’t float the Veselnitskaya meeting in an attempt to entice the Trump campaign into colluding, it may have reaped other rewards. The Trump campaign “provided a gift to the Russians by covertly signalling to them that this team was ready and willing to be compromised,” said Ned Price, a former CIA analyst who served as the senior director of the National Security Council under President Barack Obama. If Veselnitskaya was acting as an agent of the Russian government, then Russia has known for months that the Trump campaign was willing to accept the services of a hostile foreign power working to influence an election.